Setsuko Thurlow, a Hiroshima atomic bomb survivor and Hiroshima Peace ambassador received the Ahmadiyya Muslim Prize for peace in March. 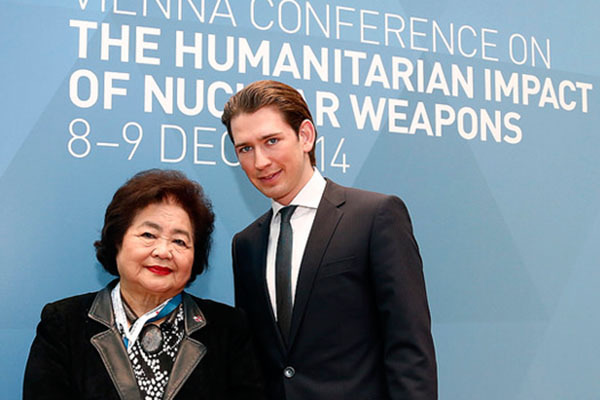 Photo: Setsuko Thurlow with the Austrian Foreign Minister at the 2014 Vienna Conference for the Humanitarian Impact of Nuclear Weapons. LONDON — Hiroshima atomic bomb survivor Setsuko Thurlow was honoured with the Ahmadiyya Muslim Prize for the Advancement of Peace in London, England, on March 25. The Ahmadiyya community, established in 206 countries, spearheads international efforts to promote global peace and respect and human rights for all. Thurlow was cited for a lifetime of service to her community as a social worker, helping fellow immigrants in Toronto and as a disarmament educator and global advocate for the prevention of nuclear war. Through her decades-long advocacy, Thurlow became a major voice in the global effort to establish a UN convention that would outlaw the manufacturing and possession of nuclear weapons. As a hibakusha (Japanese for atomic bomb survivor), she spoke at international conferences in Geneva, Mexico and Austria about the humanitarian impact of nuclear weapons that led to the current UN ‘Ban the Bomb’ negotiations in New York. Ms. Thurlow addressed an audience of 10,000 at an International Conference Against Atomic and Hydrogen Bombs in Hiroshima and has also spoken in Norway, Sweden, Austria, Germany, Ireland, Scotland, England and in Washington, D.C. and other U.S. cities. Ms. Thurlow will address members of parliament, followed by a press conference, in Ottawa at the beginning of June and then travel to New York for the final vote on the UN agreement to ban nuclear weapons in July. NHK in Japan is producing a 50-minute documentary on Thurlow’s peace work. She was appointed a Hiroshima Peace Ambassador in 2015. Much to Ms. Thurlow’s dismay, Canada regrettably is not participating in the UN ban the bomb negotiations because of pressure from the U.S. and other NATO allies. Along with her late husband Jim, Ms. Thurlow was one of the founders of the Hiroshima Nagasaki Relived Peace Education group, founded in Toronto in 1975. An active member of its successor organization, the Hiroshima Nagasaki Day Coalition, Ms. Thurlow will read this year’s Hiroshima Peace Declaration at the annual Hiroshima and Nagasaki commemoration at the Toronto City Hall Peace Garden on August 6. Good article about an amazing person and a faith organization bringing hope for a peaceful world..